William Cheng, top contributor to Swagger Codegen, recently informed us about a big change for the swagger community. William and other top contributors (40+) of Swagger Codegen have decided to fork the project to maintain a community-driven version called "OpenAPI Generator", which supports both OpenAPI spec v2 and v3. For the reasons behind the fork, please refer to the official Q&A. The founding members came to the conclusion that Swagger Codegen 3.0.0 beta contains too many breaking changes while they strongly believe 3.0.0 release should only focus on one thing: OpenAPI specification 3.0 support. Swagger Codegen 3.0.0 beta was evaluated as unstable. Changes made directly to 3.0.0 branch without reviews or tests, were breaking the builds from time to time. Reviews of code changes in the 3.0.0 branch highlighted a lot of code block removal without any reason. This might produce regressions for edge cases discovered previously. Most of the test cases in the generators have been commented out as part of the migration to support OpenAPI 3.0. Test cases are the most valuable assets of the project and should be maintained to ensure a good quality. According to SmartBear Software, Swagger Codegen 2.x and 3.x should be supported in parallel for a while without the possibility to work with git branches to merge the fixes from one branch to the next. Having to implement everything twice is not a good idea and the best use of the Swagger Codegen community resources. Having a community-driven version can bring the project to the next level. There were several conversations with SmartBear Software (the company behind Swagger) via emails, gitter, Skype call and GitHub issues. But there was no consensus on the next steps and on the direction for Swagger Codegen 3.0.0. Swagger Codegen is driven by SmartBear Software while OpenAPI Generator is driven by the community. Three years ago, in 2015, SmartBear Software has acquired the Swagger API open source project from Reverb Technologies. Swagger Codegen implements a toolset for the OpenAPI Specification (OAS). The OpenAPI Specification is a community-driven open specification within the OpenAPI Initiative, a Linux Foundation Collaborative Project. Swagger or more more precisely the OpenAPI Specification is the de-facto standard for re-usable and maintainable APIs. As of July, 2017, Swagger tools are downloaded over 100,000 times per day, according to hosting repositories Sonatype and NPM (source: Wikipedia)). More than 40 top contributors and template creators of Swagger Codegen have joined OpenAPI Generator as the founding team members and are now focusing on making enhancements and creating new generators to the OpenAPI Generator project. 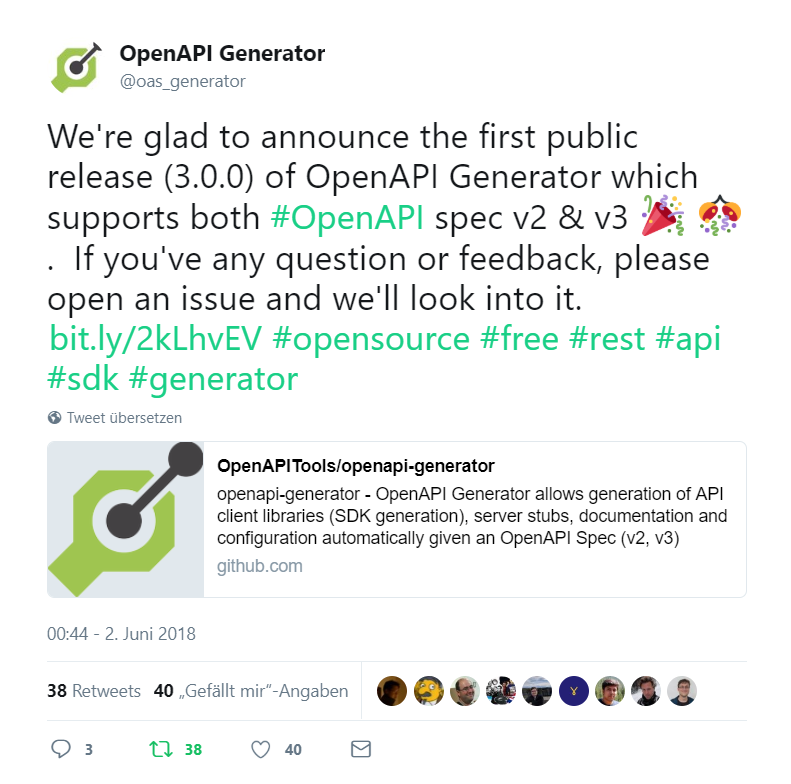 The new team already released the first stable version 3.0.0 of OpenAPI Generator. Please give it a try and let them know if you have any feedback. This is a great opportunity for the community in general. As you can see in the Q&A there was a lot of frustration. The fork will allow all contributors to fix those technical issues and concentrate on new ideas. Right now everybody is busy making enhancements to the OpenAPI Generator. For example, some big work has started on the gradle plugin. Later a full switch of the build tool from maven to gradle could be possible, as it's building a lot faster than maven. If you are new to code generation in general, you might want to read our article "Generating Angular API clients with Swagger" and start with the new OpenAPI Generator. If you already use swagger-codegen then you will want to migrate from Swagger Codegen to OpenAPI Generator sooner rather than later. Please refer to the migration guide for this. Right now it can be used as drop-in replacement. As for now, SmartBear Software has not mentioned any plan for swagger-codegen. We will update this article if there will be an official statement regarding the fork.